Protesters demand greater democracy in Hong Kong. There’s a new symbol of defiance in Hong Kong. It’s the old flag. Under colonial rule by Britain, the Hong Kong flag was dark blue with a Union Jack in the corner and the seal of Hong Kong in the centre. On 1 July 1997 when this nation returned to Chinese administration, the flag was changed. Today the standard is a red flag with a large white bauhinia flower. 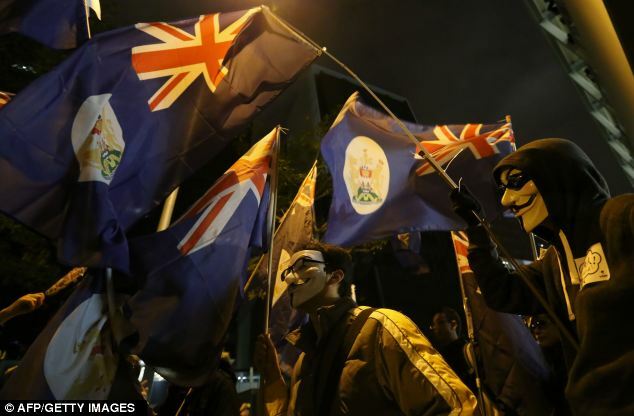 Now when protesters march they wave the old flag – especially as its appearance riles the government. On New Year’s Day in Hong Kong, both flags made an appearance. One was leading a protest march demonstrating disappointment in the leader of Hong Kong, Chief Executive CY Leung. (Yes this bastion of capitalism is led by a CEO.) The other march was organised by supporters of the government. These marchers proudly waved the current flag – bauhina and all. Chief Executive CY Leung faces challenging times. His earliest policy maneuvers to introduce education reforms with a pro-China nationalistic curriculum brought Hong Kong to a standstill as hundreds of thousands marched. His home has been subject to ongoing investigation due to illegal structures built on site. His management of the issue has been clumsy and amateurish with back-flips and admissions of having forgotten constructions. This year the New Year march against government was larger than in the past. The pro-government march was also a new feature. This polarisation of the city is a concern to government – and a concern to Beijing. Above all, the citizens of Hong Kong don’t trust their leader. 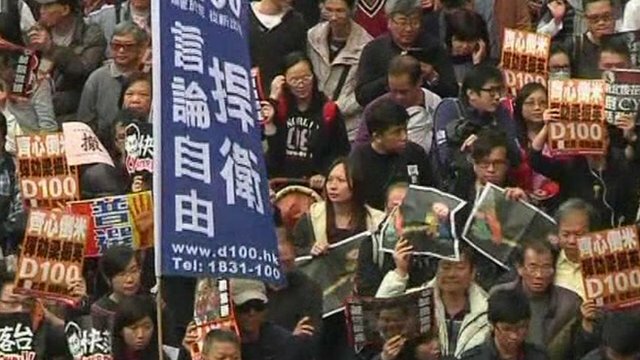 New Year protests against Chief Executive CY Leung in Hong Kong. On 16 January CY Leung presents his policy address for the new year. This is his first annual speech to the nation, and many expect a load of populist measures (free education, increased teacher wages, old age support). But deeper reforms to support the economy and address demands for democracy are unlikely to be included. Any large budget additions – or changes to the political system – will face resistance from legislators (budget) and Beijing (democracy). In a year of economic challenges, 2013 promises to offer political challenges as well. This is a time strong, unified leadership is a necessity. Having a nation at odds – and a legislation unable to work with its leader – is a recipe for stalemate and uncertainty. We don’t need to turn to America for lessons in political stalemate. We have that here in Hong Kong. Thousands prtest in Hong Kong on New Year’s Day 2013.